I don’t know if that’s it, but I think that’s it. Here’s why: The queen in the hive is at least three years old, maybe four years old, and she’s not laying as much brood as she used to. But here’s the clincher: I removed five frames of brood from the hive about two weeks ago to boost up another colony that was slow to build up this spring. I virtually removed all the capped brood from the hive, and some open brood too. So the Lack of Brood theory makes sense. The last time I saw pollen in the honey super two summers ago, that colony was on the way out as well. It was also suggested that the bees tend to store pollen close to the most active entrance, and seeing how the most active entrance in the hive is above the honey super, the bees are naturally dropping the pollen in the honey super. But I don’t buy that because then most of my honey supers I’ve had since 2010 would have had pollen in them, and most of them haven’t had a spec of pollen. The lack of brood makes even more sense because when I suddenly removed the frames of brood, all the bees that would have normally been occupied with nursing duties had nothing to do, so they probably got a little off kilter and started filling pollen in the honey super instead. A perfect example of stupid humans messing up everything. The colony was probably low on brood to begin with and removing more brood only made the pollen-in-the-honey-super situation even worse. At any rate, if I ever see the bees store a lot of pollen in the honey super again, I’ll remember that it could be a sign there isn’t much brood in the hive and that the queen could be failing. I might also invest in a hive-top pollen trap. I’ll gladly update this mini-ramble with other information if it comes my way. But for now, those are my conclusions. JULY 12, 2016: Note to self: The next time I steal most of the brood from a hive, remove the honey super along with it. 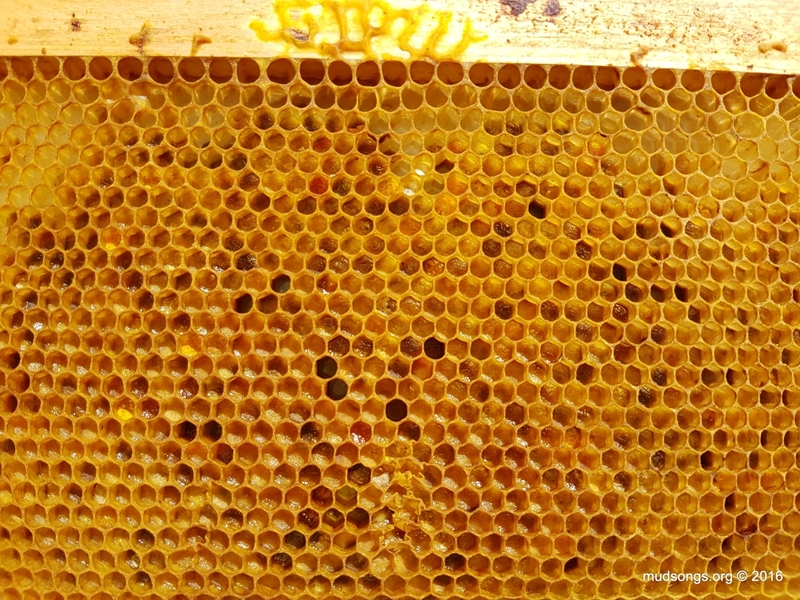 This entry was posted in Behaviour, Brood Frames, Failing Queens, Mistakes, Month of July, Pollen, Pollen Frames, Year 2016 and tagged Stuff That's Good To Know. Bookmark the permalink. ← Ants Around Beehives, a temporary pest? I just love all your careful observations. I know i could print out the blog pages, but heck, if you compiled them ALL (even the one with the red ant picture), and offered it for sale as a book, i would buy it in a minute. Thanks for all your efforts…we’ve learned a lot from you, here in our 4 hive setup in Kentucky. Thanks Sarah. This post is also a good example of where I’m coming from as a mentorless beekeeper. Like many beekeepers in Newfoundland, it’s rare for me to meet up with more experienced beekeepers, beekeepers who could probably tell me right away why pollen is in the honey supers. I’ve been at this since 2010, but in many ways I’m just a beginner. However, my beekeeper internet friends are usually pretty good at setting me straight and I thought it might be fun to show I’ve learned much of what I know. I’ve learned more from online resources and beekeepers I’ve met online than any other single resource. thank you so much, i have been confused over same thing ! also mentorless and taking the hard learning curve many of your posts have put a light on things from a different angle causing the penny to drop as we say. You are a careful and curious observer, and your blog has been one of my greatest resources. Thanks Catherine. I could be wrong about this one because I have seen pollen from time to time in the honey supers in healthy colonies. But it was usually only a few cells here and there, not full frames of pollen. Judging from what I’ve seen and what my trusted advisers has described, though, I think I got it. I hope. Hi I just harvested my honey and there was pollen on my honey! Is this going to spoil my honey? Love your info! In my case I had nothing but pollen stored in the honey supers, but some pollen here and there mix in with the honey isn’t unusual. I’ve never known it to spoil the honey.